Luminaries have an interesting history. According to tradition, shepherds left small bonfires pointing the way to the manger of the Christ child. For centuries on Christmas Eve people in Mexico would light bonfires in an outdoor area to honor this Christmas tradition. They would sing and celebrate. Afterwards, they would light small fires in front of their homes to welcome the birth of Christ. According to tradition, in the 20th century there was a poor family that couldn’t afford the wood for the Christmas Eve fire. One of their children put a lit candle in a paper bag half filled with sand and put it in front of their house. Paper bag luminaries are popular to this day. Now there are real candle luminaries, battery operated luminaries and electric luminaries that are used outdoors. 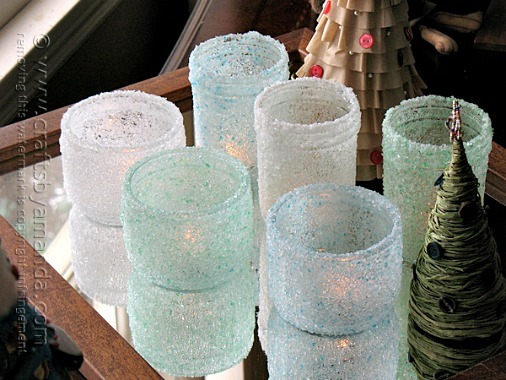 I saw this tutorial for Epsom salt candle luminaries and thought they looked beautiful. They’re perfect decorations for weddings, birthdays and holidays. Amanda includes a very nice step-by-step tutorial including some helpful photographs. She also offers suggestions on coloring and preserving the luminaries. Excellent tutorial! Click on the How to Make Epsom Salt Luminaries link bto see the tutorial.